Dust Agitator Serie is presented by KHEOPS as part of the Sommet : Infrastructures et enjeux sociaux. 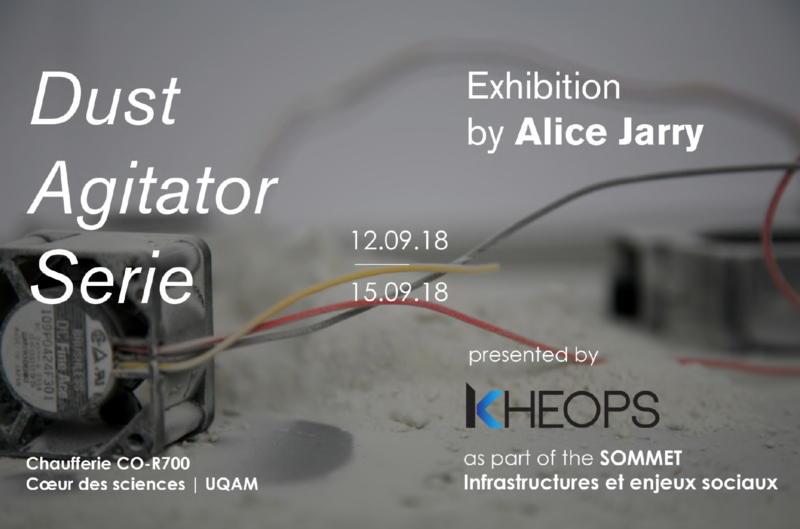 The exhibition will take place from September 12th to 15th, 2018 at UQAM’s Chaufferie du Cœur des sciences. Alice Jarry’s research-creation projects offer new modes of engagement with materiality in the field of digital arts. The proposed installations explore glass manufacturing processes and technologies : sand extraction, as well as aggregates and recycled glass powder used for infrastructure. This aesthetic experience positions residual matter in a field of critical vigilance regarding the exploitation of natural resources and the health and well-being of populations and industry workers.